← This is no way to start a week! I am grounded. No mushing. 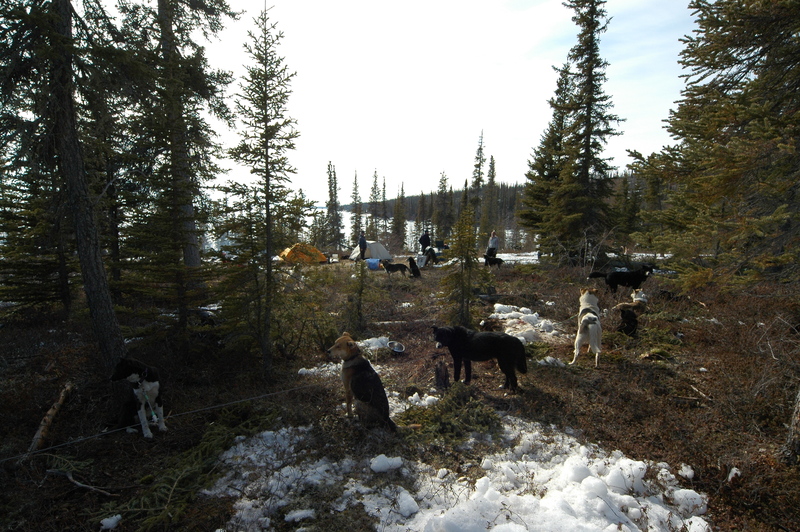 Long sunny spring days are the best part of mushing and I can’t go. First I managed a 100% rupture of my right hamstring. Slipped on the ice which was the first part of the injury and the finale was slipping on a little puddle of puppy pee on the kitchen floor in the middle of the night. I did the splits. Even when I was young and nimble I couldn’t do the splits and it is certainly a bad idea now that I am old and the floor is so very far away! Dr. Wade, the orthopedic surgeon grounded me. Here is how our conversation went. So I sulked out of there. Fast forward three weeks and I am feeding dogs. I know, I know but Darrel has a torn rotator cuff and is due for surgery. I step into the second to last dog circle and before I know what is happening, down I go. In slow motion I watched my arm twist up and over my head in a very unnatural fashion and then the pain. I was laying in water and dog poop sincerely hoping the 110 lb Malamute wouldn’t jump on me but he was way too busy eating all the food I spilled. I tested my hand and only a couple of fingers would move. Ok, I thought, I’ve broken my arm. I couldn’t even will it to move so I rolled onto my left side, got my feet underneath me somehow and walked to the house. Darrel helped me get my coat and hoodie off and I wish he hadn’t. The top of my shoulder had dropped about 4 inches. The pain was unbelievable. Darrel got the poopy clothes off me and some clean sweats on me – sans underwear because I didn’t have any clean ones…..sorry Mom. By the time we got to the hospital I was ready to crawl out of my skin. I have never experienced pain like that. After much drugs, x-rays and more drugs, my arm was popped back into where it belonged and it wasn’t so bad. “Today was a little bit better – not that yesterday was awful because it really wasn’t. Maybe it was because we were a little more organized or maybe because we had already run the trail, but overall I thought it was a smoother day. “I was pretty tired last night. Fell asleep watching a movie. I figured I’d be really sore but it wasn’t so bad this morning. I thought it would be harder to leave the lodge than it was. I still felt a little down about it but I am also ready for a change. “Mike (lodge owner) helped us with the hook-up and we were off. Ran Nodd and Mobad in lead and had a problem on the first turn. Tim hopped out to help direct and the snow hook bounced out and hooked around my ankle. I couldn’t brake and had a vision of flipping and falling off, being dragged by the ankle across the lake! “Then Nodd decided to take a dump and just stopped, bunching up the whole team. She and Digger got into it and poor Mobad was caught in the middle. We got it sorted out and were on our way once again. “Nodd and Mobad did really well in lead. 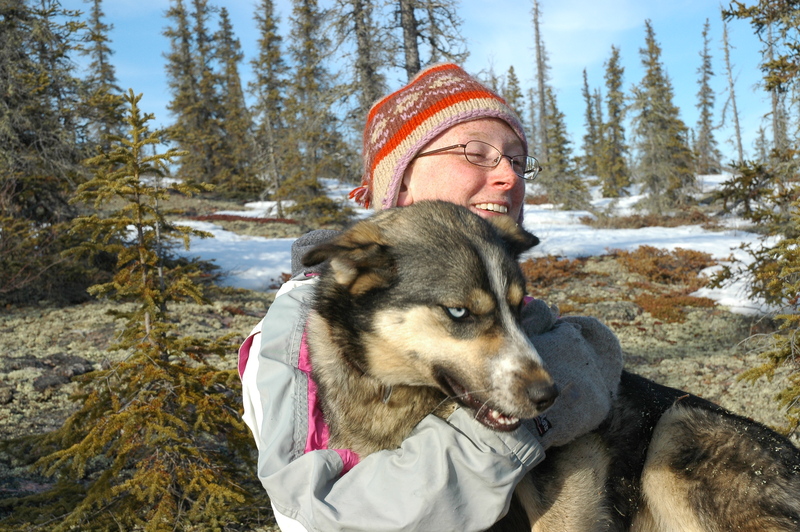 Poor Denali was not happy with the state of the trail – I was afraid she was going to balk the whole way but in the end, with a little coaxing and encouragement, she did fine. “The overflow was all frozen over today which was a small blessing! It was a bit sketchy though watching the ice underneath you fracture as you slide across it! We saw and eagle today. It soared right over us at tree top level which was pretty cool! Tim commented that the eagle was looking for lunch – I hoped it wasn’t us! 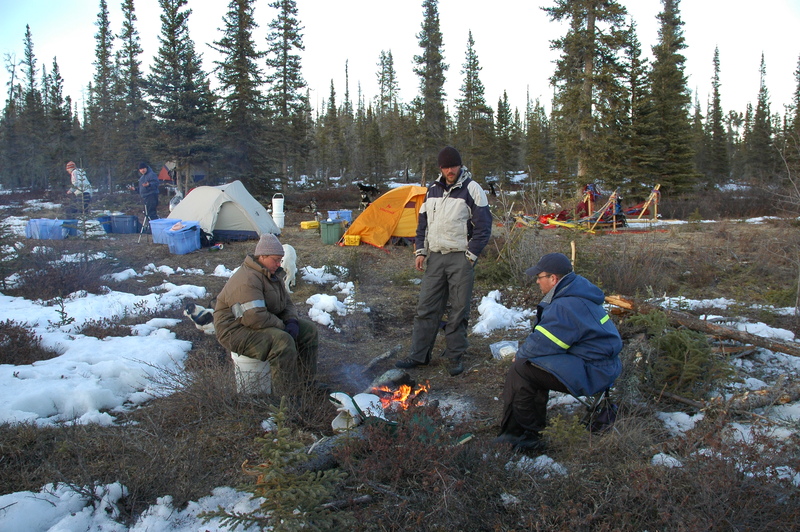 “We made it to the camp in good time. Tim had to ride the drag brake with both feet all the way down the Great Slake Lake hill, which had zero snow on it, and we were still cruising! James came up behind us with his team sounding like Yosemite Sam, yelling whoa! You just couldn’t stop them! We sheared two bolts off the brake on our sled. Our first camp. Would have been perfect with snow! James, Joc and Perogi hauling water. Most of the water we needed each day was for the dogs. The dogs are staked out on picket lines and watch their humans with interest. Joc and Bubbles. Hard to believe that that pup is now just a few months shy of 11 years old! A few moments around a warm fire before bed! This entry was posted in Uncategorized and tagged Alaska, alaska malamutes, alaska. 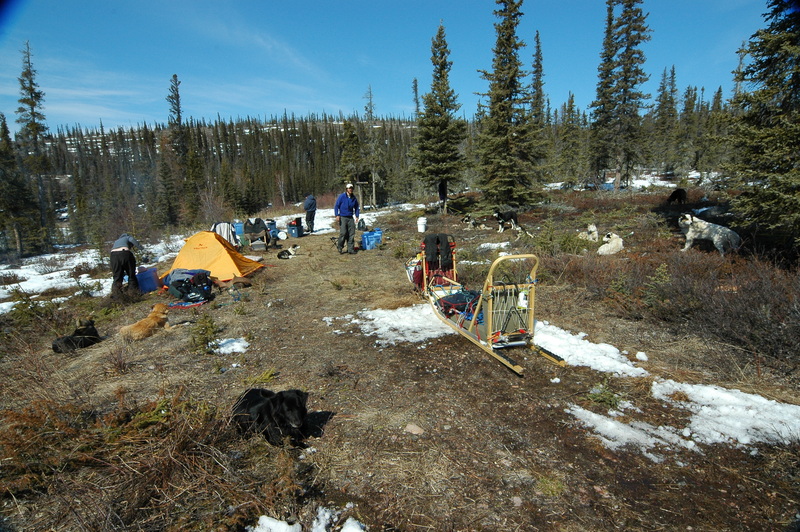 mushing, Northwest Territories, winter camping. Bookmark the permalink. I’ve enjoyed reading your posts…will there be more? Thanks for your encouraging words. I just put up a new post and hope you enjoy it!